Find a Christmas & New Year trip that explores Bali. There are 31 tours to choose from, that range in length from 3 days up to 26 days. The most popular month for these tours is June, which has the most tour departures. "The tour exceeded all expectations I had. 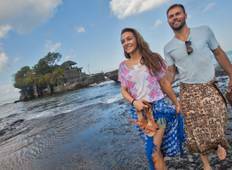 It showcased many sights that Bali has..."
"Great tour, got to see a lot of Bali I never would have had opportunity to see. Our..."
"Had an amazing time!!! the location was quite nice and the food was fine, but the..."
"Perfect package from A to Z. We were well greeted at arrival. Our hotel was great..."